Creepy crawlies have invaded Iowa this summer—and they aren't your garden variety bugs. A 17-foot-long red cedar dragonfly, a 1,200-pound praying mantis, and an army of 25-foot-long ants are among the "Big Bugs" that have been spotted at the UI's Lakeside Laboratory at Lake Okoboji. Fortunately, the insects—made of twigs, branches, saplings, and trees—swarmed to northwestern Iowa as part of an art exhibit to help the lab celebrate its 100-year anniversary. 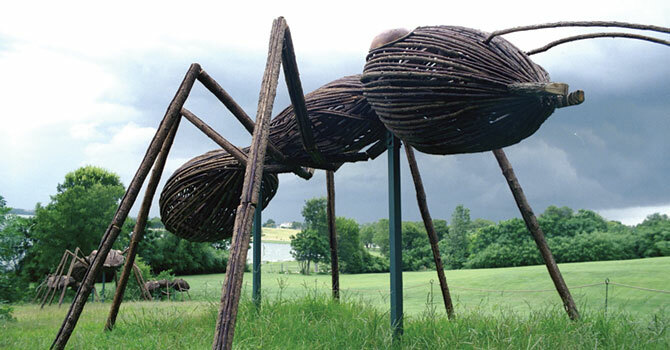 Designed by New York sculptor David Rogers, the traveling "Big Bugs" show entertains and educates visitors about the valuable role that insects play in our world. UI alumni and friends gathered at the Lakeside Laboratory this past July for a UIAA Lifelong Learning event on the bugs, but more opportunities exist to see the show. The larger-than-life exhibit runs through October 4, and is free and open to the public.